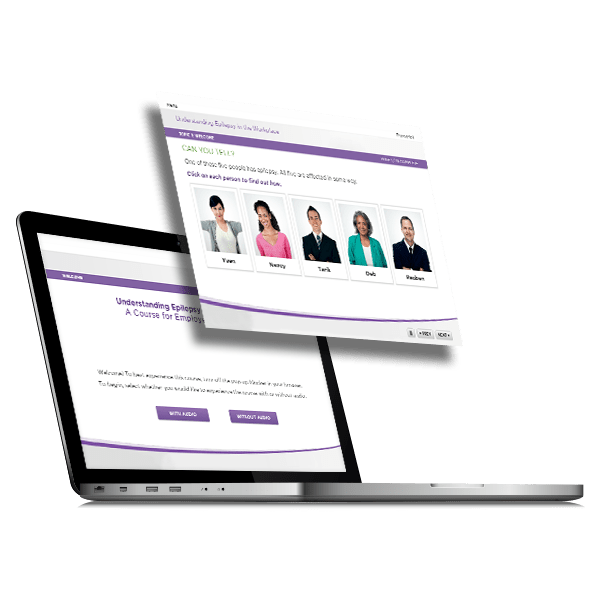 We have been developing eLearning courses in the entire Articulate suite of products since 2004 – from Articulate Presenter and Articulate Studio to Articulate Storyline 3, 360 and Rise. 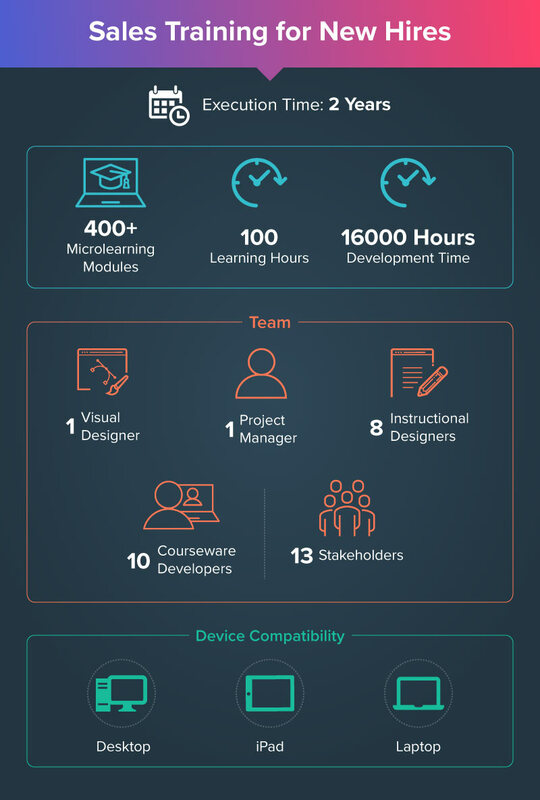 Our team of Articulate Storyline experts has developed thousands of courses to address our customers’ training needs through effective and efficient eLearning content. Please scroll down to get an idea of our team’s advanced proficiency in the tool. 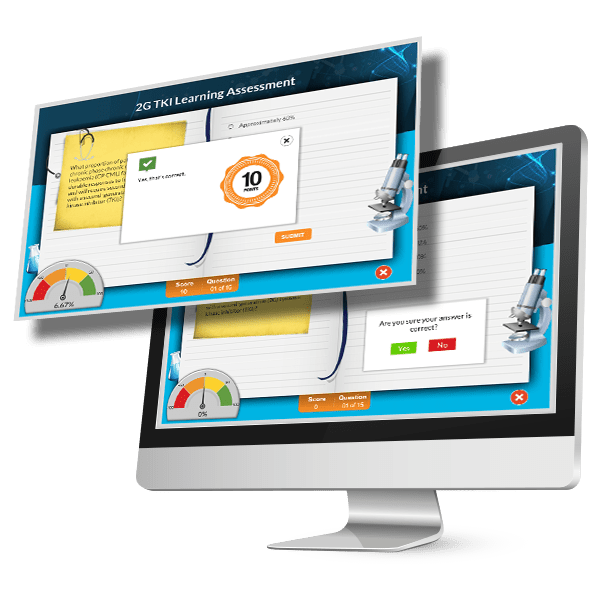 One of our customers wanted to develop an eLearning curriculum of 6 modules, with each module a separate Sharable Content Object (SCO is a unit that can be tracked by an LMS) with its own final quiz and completion criterion of 80%. 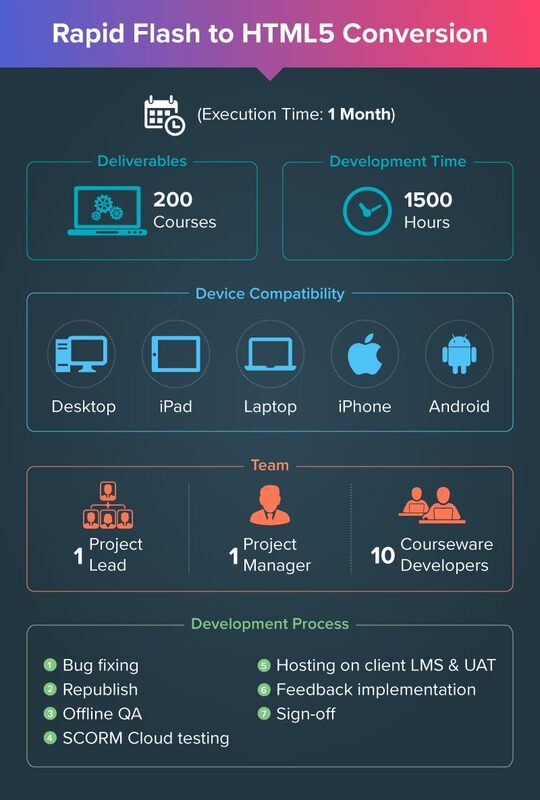 The customer wanted a common interface and launch page because their current LMS did not allow for setting pre-requisite modules in their curriculum. Our developers used Articulate Storyline 2 to first publish the modules as individual SCOs. Then they created a multi-SCO wrapper (parent folder) that contained the modules. The parent SCO package had a launch slide that allowed learners choose their module linked to its respective SCORM packages per the necessary pre-requisite rules. The parent imsmanifest.xml was modified to complete the tracking on LMS. A customer wanted us to develop a scenario-based compliance course for its global staff of 33,000 employees. The company needed an LMS report of users’ responses to each scenario, along with the number of attempts to get a scenario right, to fulfill regulatory requirements. Our developers leveraged Articulate Storyline 3 and published the course to SCORM 2004. By modifying certain tags in the published SCORM version, our developers ensured that the course passed the scenario questions to the LMS instead of the identifiers. The LMS interaction report contained information on the responses for each attempt in the scenarios, including the feedback provided to the user. One of our customers from the healthcare industry wanted to assess the confidence levels of their experienced sales staff and we proposed the following gamified approach to achieve the required outcome. 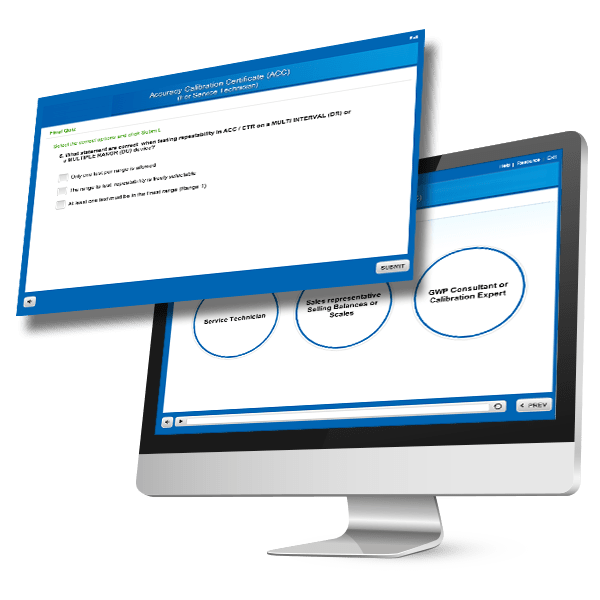 Using Articulate Storyline 360, our developers created an assessment-based course where the learner would be presented with options for each question to check their degree of confidence. The learner gets full score if he/she is fully confident and the response turns out to be right. In case the confidence level is low, but the response turns out to be right, they get a lesser score. If the learner is fully confident but the answer turns out to be wrong, they get a negative score. Based on these scores, a cumulative confidence metric was passed on as a percentage to the LMS. An international financial services company wanted us to develop a course that could cater to learners with different accessibility requirements. The challenge was to accommodate audio narration of the text, animations and pictures for visually challenged learners along with course audio enhancements that were needed for the hearing challenged learners. We used Articulate Storyline 2 to build the course using a slide-by-slide accessibility approach. Each slide met the accessibility requirements through closed captions, colors, image consistency, and so on. We solved the audio issues by including a screen at the beginning where the learner was asked to choose between the “audio” version and “no audio” version. When the “no audio” was selected, triggers were used to automatically mute the audio and enable closed captions with keyboard support and content focus to help auditory learners. 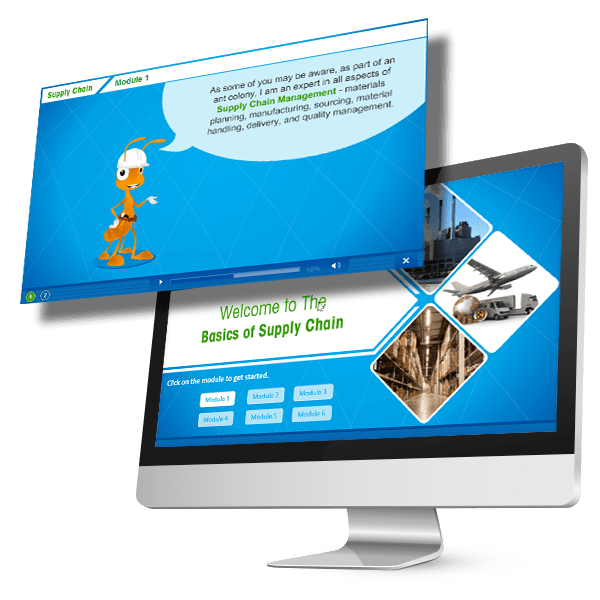 A global manufacturing leader wanted to address product training for Sales professionals, Service technicians and Sales managers through eLearning. Part of the course content was specific and relevant to each job role, and the rest of the content was applicable to all roles. The course also needed to have final assessments for each role to be tracked individually. Using Articulate Storyline 2, we programmed learning paths that allowed learners to enter the course based on their job roles. As Articulate Storyline would give multiple result pages for different assessments, we developed a single question bank with layers containing questions for each user group. Questions were displayed based on the role, but still gave a single ‘Result’ page that was tracked by the LMS – a quick solution that gave the customer exactly what they needed, without spending time on trial and error experiments. 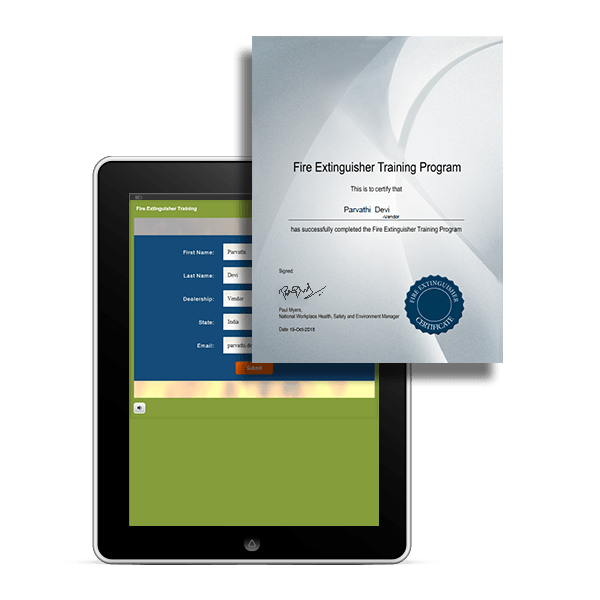 An automobile major wanted us to develop and host a Fire Safety eLearning course, where learners’ progress needed to be tracked and a course completion certificate was to be issued at the end. This certificate was to be sent to the learner as well as their training manager, all without an LMS! We built the course in Articulate Storyline 3, starting off with an Introduction screen to collect learner details. We also programmed the tool to generate the certificate within the course. The course was built in such a manner that on successful completion of the final quiz, the certificate of completion was sent by email to the learner and their training manager. 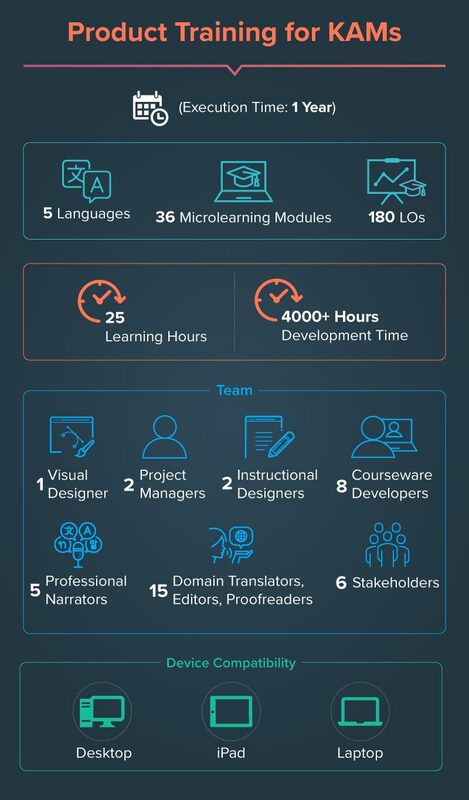 Browse the case study infographics below to get an idea of CommLab’s capabilities as a rapid eLearning solutions provider. Developed Product/Brand training for Key Account Managers (KAMs) by converting ILT material to microlearning used for onboarding and also as performance support. This digital training resulted in the reduction of the ILT from 6 weeks to 2 weeks. Success Mantra: Training client stakeholders on content gathering and drafting, standardization and constant communication. 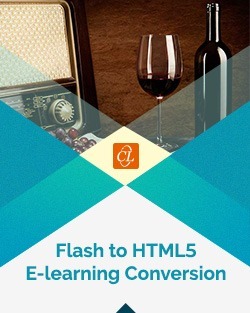 Converted a large repository of Flash courses to responsive eLearning (HTML5) that runs on multiple devices for a US-based chemical leader in the newer version of the tool. Took the opportunity to fix existing bugs for a seamless learning experience. Success Mantra: Well–defined scope, check sheet, and process adherence. Designed product training curriculum for an oncology major in Europe in 5 languages. Success Mantra: Collaboration with the client, 2 onsite visits, standardization, and reusable assets.